Spending the weekend in Somerset East a couple of weeks ago, I had the opportunity to explore a town which I didn't know very well. 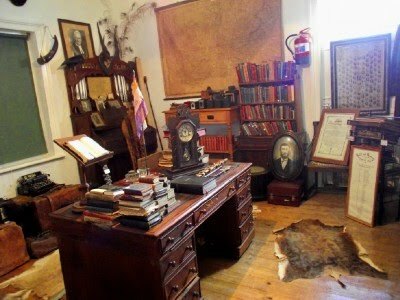 One of the main attractions in Somerset East is the Somerset East Museum, also known as The Old Parsonage Museum. 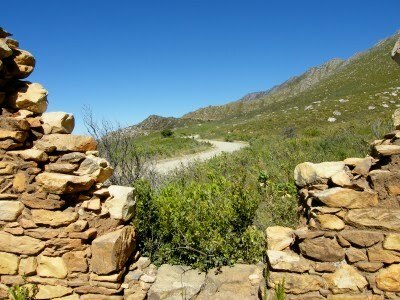 The museum is situated just outside town on the slopes of the Boschberg Mountain . Shortly after the establishment of the town of Somerset, 1825, land on the slopes of the mountain was given to the Wesleyan missionaries for a chapel and graveyard. The chapel was completed and consecrated in 1828, but a few years later the building and surrounding land were transferred to the Dutch Reformed Church. In 1835 the chapel was converted into a parsonage and during the 105 years the building was used as a parsonage, four ministers lived there. In 1971 this example of a Georgian manor house was made available as a museum which was inaugurated during the celebration of the town's 150th anniversary 1975. 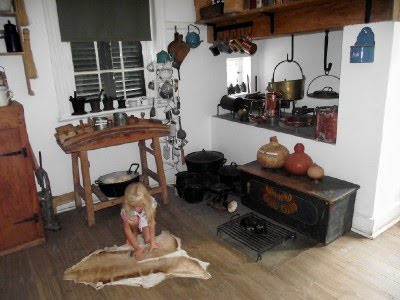 Most of the museum's exhibits are recreations of rooms as it would have looked in the 1800's. Upstairs is an exhibit featuring the Slagternek hanging which I will feature within the next couple of days. During our visit Drama Princess was very interested in the Springbok and Blesbok skins used as mats in the kitchen and study. 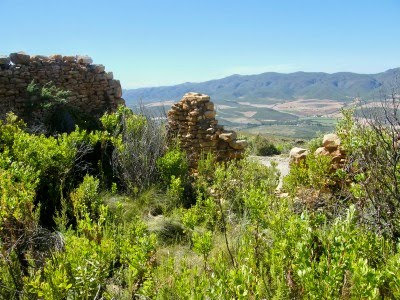 For more information, visit the Somerset East Tourism website. Last Sunday at the Ironman South Africa event here in Port Elizabeth I snapped this pic of one of the competitors who got to the start a couple of minutes late. All the other competitors were in the water on the swimming leg already when this guy came strolling by quite casually as he was putting on his goggles. For more magnificent views of the sky, visit the Skywatch. A weekend or two ago we spent the weekend in Somerset East at the guest house of a friend. 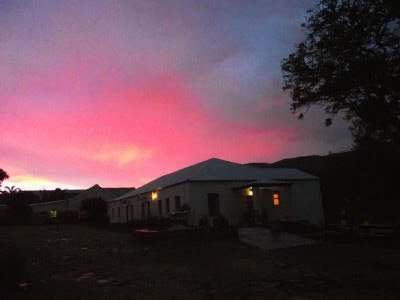 The Angler and Antelope is situated in the heart of this quaint Karoo town and is truly worthy of its 4 star status. 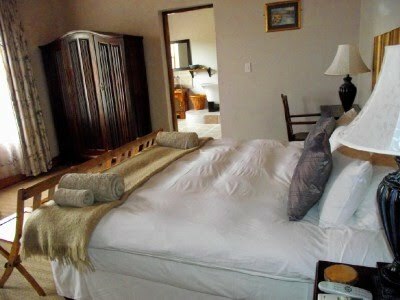 The property consist of a seven room guesthouse as well as a self catering unit called Fisherman's Cottage. A unique feature on the property is the St Francis Culinary Centre which acts as the guest house's lounge, dining room, pub and kitchen. 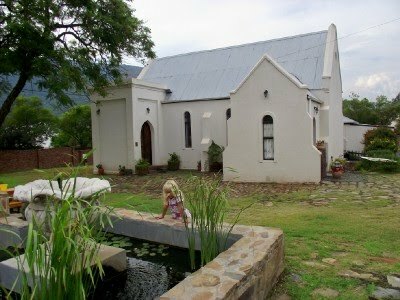 The centre is situated in Somerset East's first Roman Catholic Church which was built in 1906 and serves wholesome country cooking like Karoo lamb and freshly caught trout. Each of the bedrooms were individually decorated in a tastefully yet practical way by owners Alan and Annabelle Hobson. 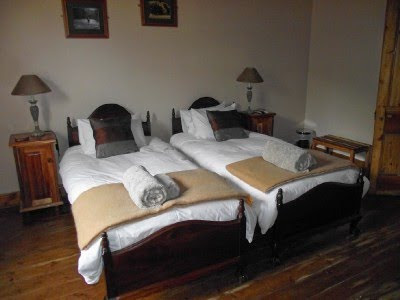 The rooms are all fitted with air conditioning for the hot summers and are kitted with goosedown duvets and pillows along with mohair blankets for the chilly winters. The old presbytery has been converted into the self-catering Fisherman's Cottage. The cottage can sleep 6 people in it's three bedrooms and has a fully equipped kitchen. We stayed in the cottage during our visit and it was ideal for us to enjoy the luxury of the guest house but to still have our own space with the Rugrats. Alan is an accredited fly fishing guide and can take visitors into the surrounding area for fly fishing excursions. He has access to private dams and waters and will show you that there are more to the dry Karoo than fossil fish. Alan even has a fully stocked fly fishing shop set up in the old confessional in one of the vestries of the building. Unfortunately on the weekend we visited the Hobsons played host to a function in the St Francis and Alan was unable to show me the art of fly fishing. That will have to wait for my next visit and will be another story. A fishy one I hope. 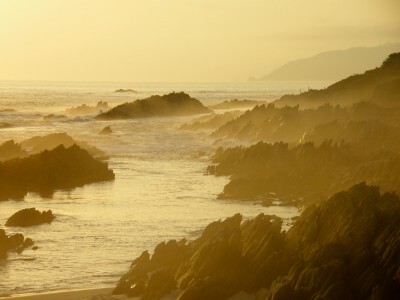 Late afternoon scene on the Tsitsikamma coast. 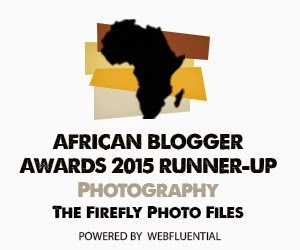 Today is the 500th post on this blog. 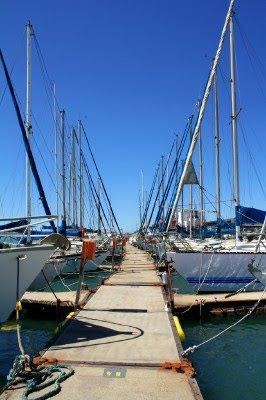 When I started the blog it was intended to just be a place to show off my photos and the place I live in. Since then it has evolved a little bit and has also become what I would like to call an unofficial photographic guide to South Africa, it's places and nature. Often I wonder if it is worth all the effort if I look at posts with only 2 or 3 comments, but if I check out Google Analytics I do find that the blog gets a lot more hits than the comments would suggest. It would be nice though to get a couple more comments. To my regular followers, thank you for your continued visits and support; and to those who stumble on this for the first time, I hope you will become a regular and pop in to say hi every now and then. Here is to the next 500 posts. 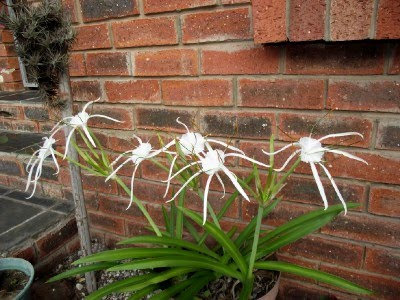 Last year in March I excitedly posted about my White Spider Lilies flowering for the first time. This year the end of March came and there were no flowers. 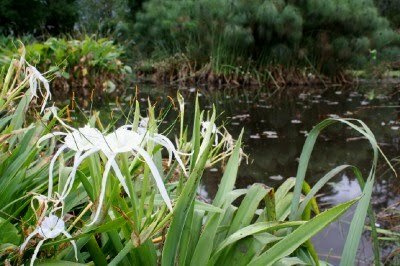 I traveled down the Garden Route at that time and found flowering spider lilies at Fancourt outside George. 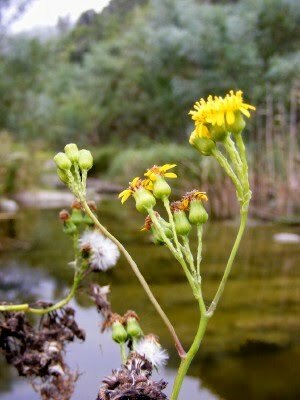 I was very disappointed that mine decided not to flower this year. That was until last week when I noticed that they started to flower. I am really chuffed. Problem now is that I thing I should take them out the pot and put them in the ground. I'm just afraid that they may decide not to flower next year. I may just attempt it though. 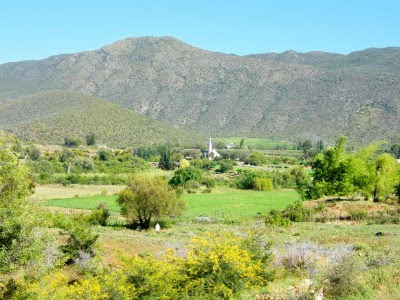 Schoemanshoek is a fertile valley just outside Oudtshoorn on the way to the Cango Caves. The area is mainly a farming area with ostriches and tobacco being farmed here historically. Even though most of the farmers in the valley still farm with ostriches and some crops, most have developed guest houses and restaurants on their properties. 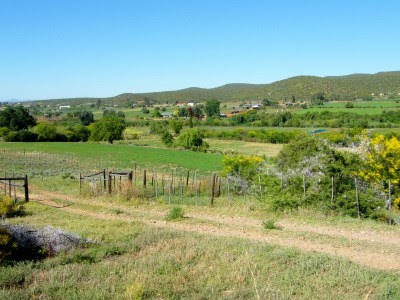 The nice thing about staying in Schoemanshoek is that visitors are right out in farming are. Most establishments are decorated with antiques while visitors get real farming hospitality with just about all the establishments dishing up ostrich steak in the evenings, served by the owners themselves. 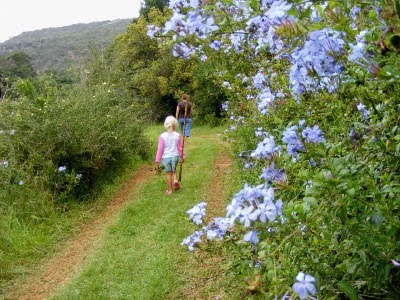 I walked down this trail earlier in the morning and thought that the plumbago bush next to the road would make a nice feature in a picture of the path Unfortunately I had no subject to put in it until I walked it again a little later with the family. 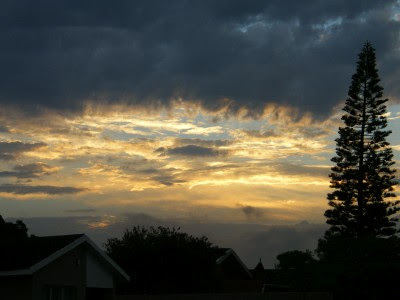 When I got home the other evening the sky looked like this. Grey, blue and white. Within minutes as the sun was going down it went to grey, orange and lite yellow. 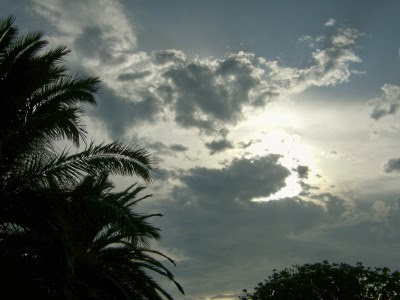 If you would like to see more pictures featuring the beautiful sky above (ash or no ash), visit Skywatch. 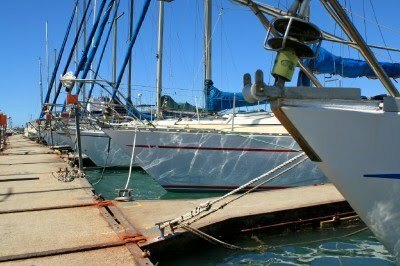 A couple of pictures from my visit to the Algoa Bay Yacht Club the other day. Fancourt is one of South Africa's most prestigious golfing estates and consist of three golf courses, the Fancourt Hotel and a beautiful golf estate featuring different developments. 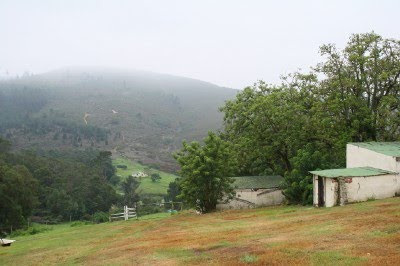 The development is situated in George on the Garden Route and plays host to the Japan team during the 2010 FIFA World Cup. My only previous visit was during the Presidents Cup which took place in 2003 on The Links Coarse and where I got to see players like Tiger Woods and Ernie Els go head to head. 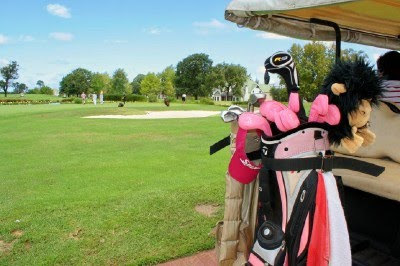 The coarse also hosted the inaugural Women's World Cup of Golf in 2005 as well as the South African Open in 2006. The other two courses at Fancourt are two of the finest 18-hole parkland layouts in South Africa, namely Outeniqua and Montagu. 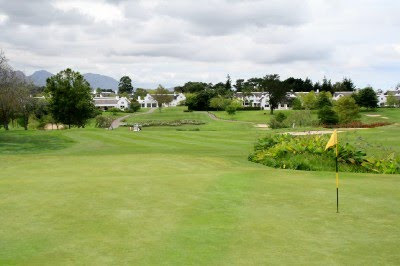 Fancourt's membership is mostly confined to property owners although a limited public membership was started in 2009. The six residential developments are all situated on the golf courses and each includes membership to Fancourt. Some of the properties are bought as a full stand and house while others are available in shares. The facilities around the clubhouse includes a spa and three restaurants. 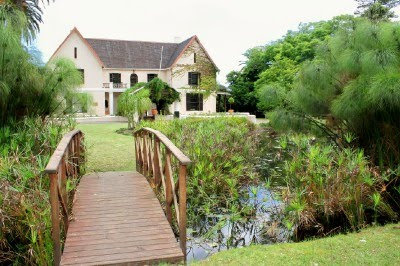 The Manor House (called Blanco House at that stage) on Fancourt was built in the style of a Cotswold Mansion from 1859. 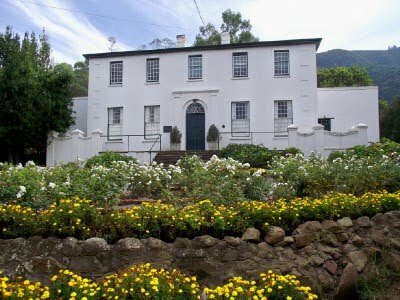 The house was renamed Fancourt in the memory of Henry Fancourt White who was involved with the building of the Montagu Pass (here and here) in the early days. Fancourt opened as a hotel and golf estate in 1989 and the current owners, German couple Hasso and Sabine Plattner, bought it in 1994. 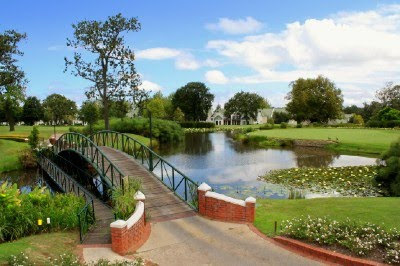 Although Fancourt is a modern complex, the historic Manor House remains its soul. 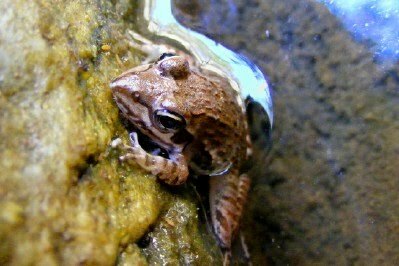 I found this little guy sitting on the side of a rock in a small pool while rock hopping up the gorge at Sleepy Hollow just outside Port Elizabeth. He blended in quite well into his surroundings and I probably would have stepped on him if I didn't look down at the last second. I checked my books but aren't sure what type he is though. The chicken came into the library and said: "Book". The librarian gave her a book, but minutes later she was back and said: "Book, book". The librarian took the one and gave her two others. Minutes later she was back again and after the librarian gave her another book, decided to follow the chicken. The chicken went out the door and around the corner there was a frog waiting. The chicken put the book down in front of the frog and the frog said: "Read it, read it". 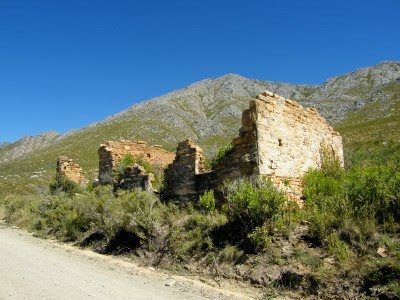 The ruin of the old toll house on the Swartberg Pass (here and here) can be found at the start of the pass on the Oudtshoorn side of the mountain. I would have wanted to spend some more time at the ruin getting photographs, but it was hot (around 40 degrees Celsius) and the family was getting impatient in the car. 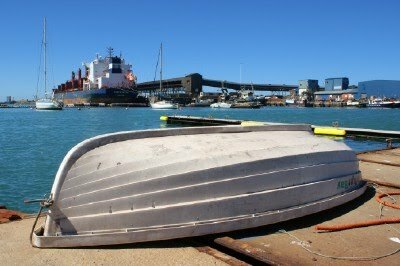 I had to go and meet somebody at the Algoa Bay Yacht Club the other day which gave me an excuse to take a stroll along the walkway between the yachts and get some pictures. And I have learned that when taking pictures you have to always be on the lookout for a potential Skywatch pic. 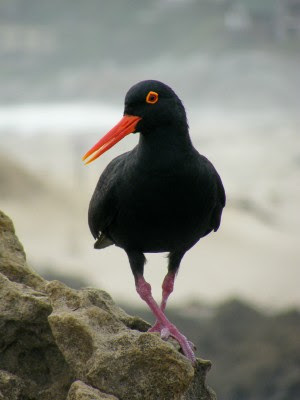 I am always glad when I see African Black Oystercatchers (Haematopus moquini) on the beach or next to an estuary. This oystercatcher is a protected bird with a population of less than 5,000 adults. They are noisy plover-like birds with completely black plumage, red legs and a strong broad red bill used for smashing or prying open mollusks such as mussels. 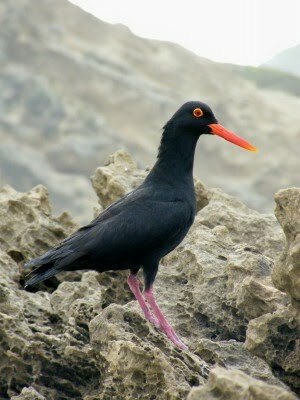 The oystercatcher is unmistakable in flight with its all-dark plumage. The call is a distinctive loud piping. The nest is a bare scrape on pebbles or shingles with the female generally laying 2-4 eggs, which are incubated by both adults. I was very chuffed with these two pics, specially the first one, as they are exactly on eye level. I was sitting on the rocks waiting for the right opportunity for a pic when this one came quite close to me. I think there must have been a nest somewhere close by as they were making a lot of noise as if they wanted to warn me off. 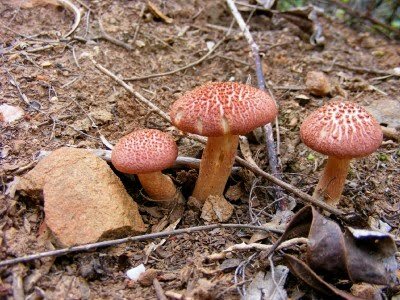 I found these orange-brown wild mushrooms while walking the other morning and has no idea what they are. I checked my Wildlife of Southern Africa book and it wasn't in there. I also checked the internet but the answer seems to be eluding me. Anybody know? Joan probably will. Travelling from Mossel Bay to Oudtshoorn a week or so ago, we made a quick stop at Eight Bells Mountain Inn for a site inspection. Although I haven't been to Eight Bells for a while, it used to be one of my regular overnight stops when I was a tourist guide. The morning of our visit there was quite a lot of fog on the mountains around the area and I got this shot looking from the hotel across to the mountain in the background. Ok, so I have a thing for barbed wire fences. 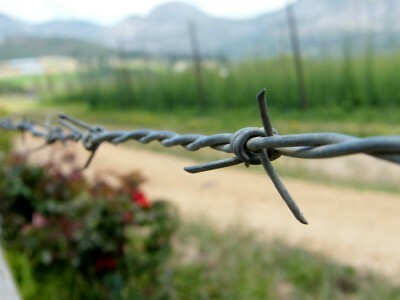 Here is one I took at the hop farm between George and Oudtshoorn in the Outeniqua Mountains. 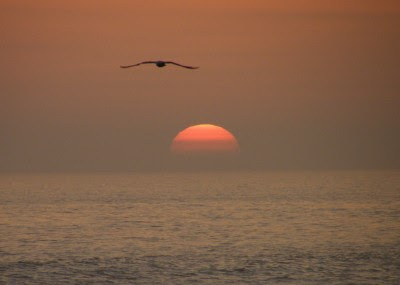 I was taking photos of the sunset at Eersterivier on the Garden Route on a recent trip and a couple of gulls flew by. I was hoping to get a few in the shot, but they were a bit far apart. Traveling down the Garden Route the other day we stopped at Bramon Wine Estate at The Crags just outside Plettenberg Bay. 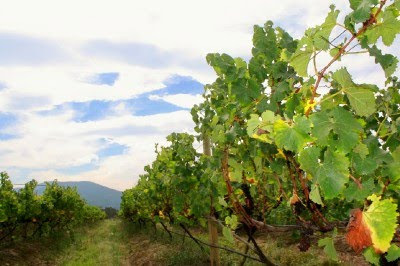 Bramon was the first wine estate this far east of the Cape Winelands and produces a superior Sauvignon Blanc 'cap classique' sparkling wine. 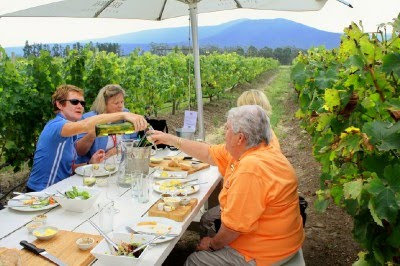 The beauty of Bramon is that the seating for their restaurant is set in the vineyards and visitors can enjoy local wines with cheeses, meats, oysters, pates and homemade bread with the majestic Tsitsikamma mountains in the background. 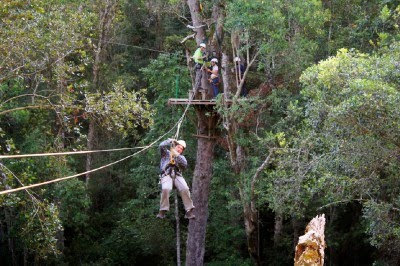 The Tsitsikamma Canopy Tour in Storms River on the Garden Route is a must do for any mild to wild adventurer. 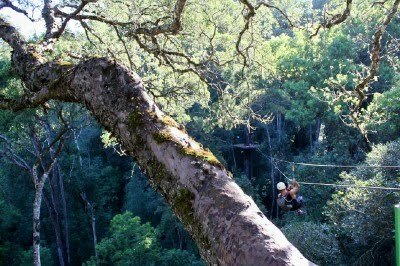 It became the first canopy tour in Africa and only the second in the world after a similar experience in Costa Rica. 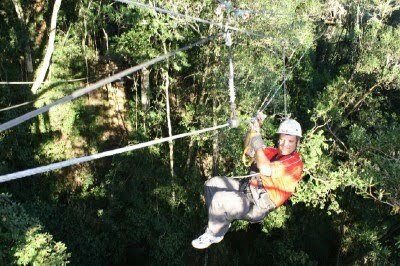 The whole experience takes place up to 30 meters above the ground in the canopy of what includes Outeniqua Yellowwood trees of up to 700 years old. The whole experience is conducted with utmost safety in mind. A safety briefing was done before we were all kitted out in our harnesses. A short trip on the back of a Landrover took us to first platform and the start of our 10 slides. The worst past for me as somebody with a fear of heights was stepping off the first platform, but once you let go you realise that the exhilaration is far better than the fear. On each of the platforms the guides were telling us about the ecology of the forest as we stood preparing for the next slide. A plus was that one of our guides was a former Miss Tsitsikamma. Is it a bird? Is it a plane? No, it's Firefly. The experience was absolutely awesome and I can recommend it to anybody travelling down the Tsitsikamma. I like roses as much as the next person. 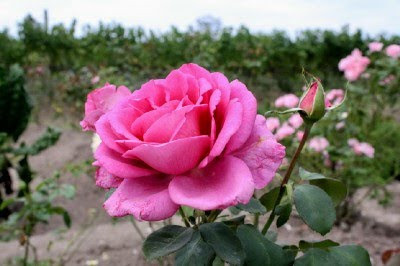 They are colourful, fragrant, romantic and can spruce up any garden. For some reason though I always find people's posts with roses in it a bit on the boring side, till I think about it and come to the realisation. Every now and then everybody needs to stop and smell the roses... 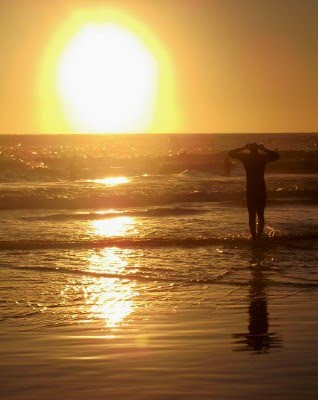 Relax... Unwind... Take it easy... That's what we are doing for the next couple of days on a camping trip. Doubt that there will be roses where we are going, but I promise to bring back photos of whatever there is. Have a blessed Easter and check you all again on Tuesday. 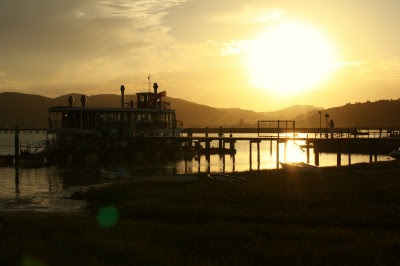 The Featherbed Company's Paddle cruiser moments before departure for the sunset cruise on the Knysna Lagoon. 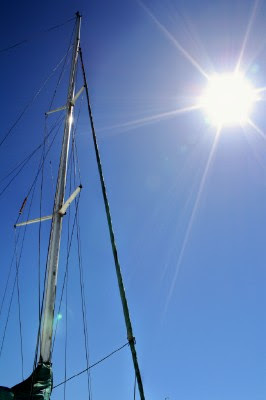 Visit Skywatch for some more breathtaking views of the sky.